In the default Magento, the products on your store are listed in bulk without any purpose. This will cause the difficulty in searching the desired products of customers. 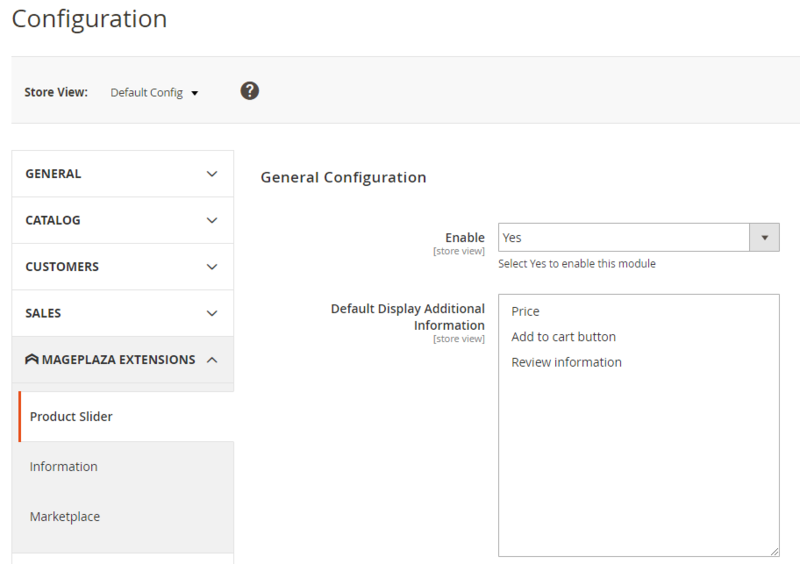 That’s great that Mageplaza has developed Magento 2 Product Slider extension that can improve the order of products on your online store. 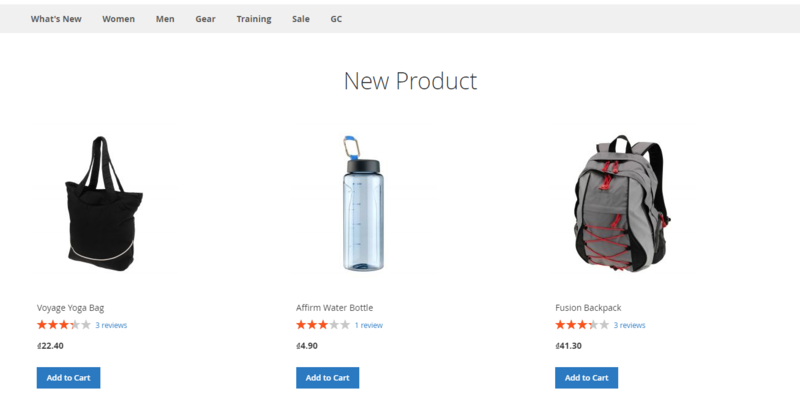 Product Slider for Magento 2 enables store owners to create many slider titles like featured products, bestsellers, most reviewed products, or new products, etc. This will be easy to attract visitors when they visit your website. Moreover, it also helps boost sales dramatically. Choose Yes so that the number of products display on the slider can be changed when changing the size of the browser window. You can set this in the Max item slider field. In the Max item slider field: This section only displays when the Is Responsive = Yes. Set the number of products display on the slide when the browser window changes the size. 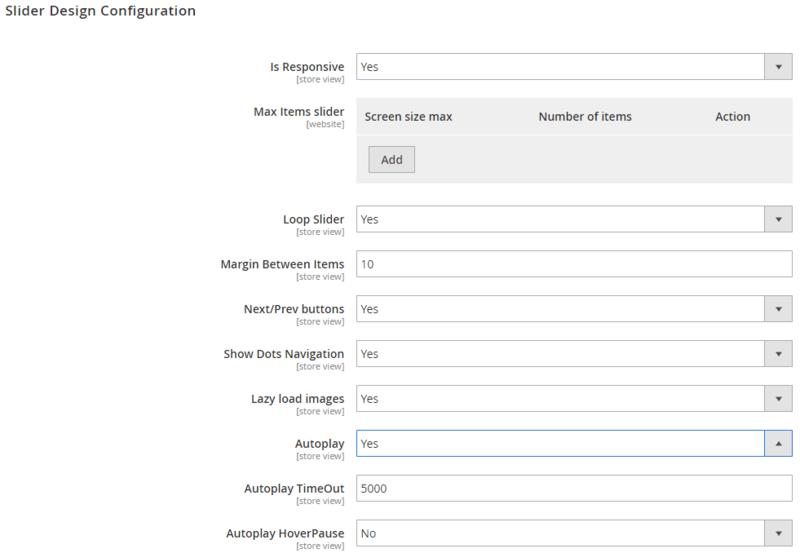 In the Autoplay Timeout field: Set the amount of time so that the slider moves a product to the left. For example, set “Autoplay Timeout” = 5000 (ms), after 5 seconds, the slider will auto-run instead of clicking on the next button to move. From the Grid, admins can understand all basic information of the rule as ID, Name, Slider Type, Slider Location, Start Date, End Date, and Action. Delete: Admins need to tick and choose “Size Chart Rule” that they want to delete, after that, choose Delete in the Action box (in the upper left of the Grid) to remove. The confirmation dialog will be appeared, then choose “OK” to continue removing. Change Status: Admins need to tick and choose “Size Chart Rule” that they want to change the status, after that, choose “Change Status > Enable/Disable in the Action box” (in the upper left of the Grid) to change the status. Immediataly, selected Size Chart Rules will be changed to the selected status. Also, admins can filter, change store view, hide/present columns or export grid. Name: The name of the slider is filled in this section only show in the backend. It helps distinguish with other products. Status: Choose “Enable” so that the sliders work well. 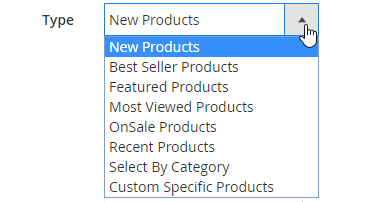 Select By Category: When choosing Type = Select By Category, Option Categories will be displayed for you to choose. 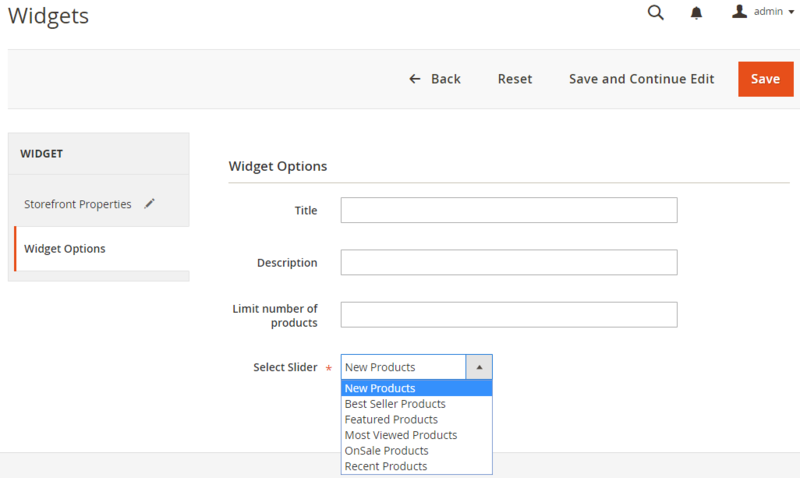 Products of selected categories will be shown on the slider outside the frontend. 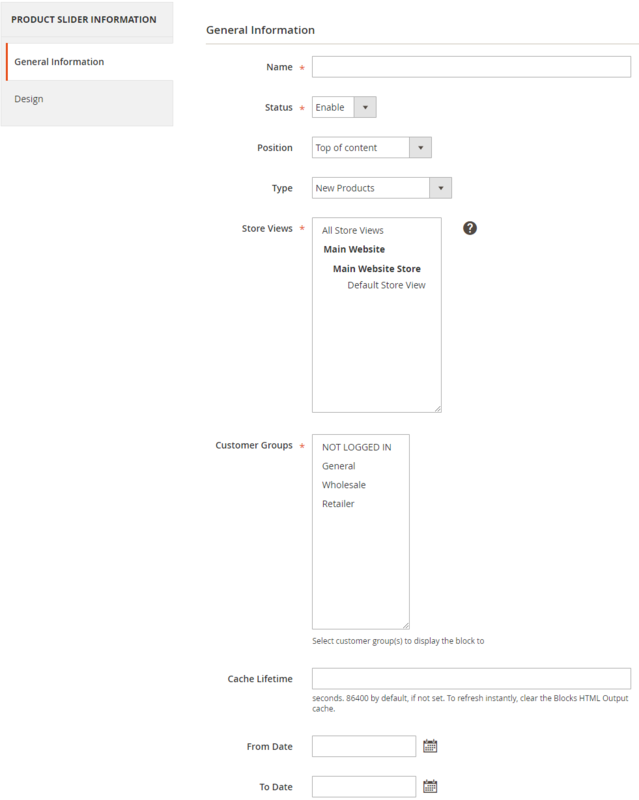 Custom Specific Products: When choosing Type = Select By Category, Tab Select Product will be displayed for you to choose. The selected products will be shown on the slider outside the frontend. Store View: Choose Store View that sliders are displayed. With unselected store views, sliders never appear. Customer: The slider only displays for selected customer group. Cache Lifetime: To refresh instantly, clear the Blocks HTML Output cache. If you leave this field blank, the default is 86400 seconds. From Date: Allow installing the date you start using the slider. Sliders will not appear on the frontend if the displayed date hasn’t come yet. To Date: Allow installing the end date that the slider is used. After this date, the slider will be hided from the frontend. 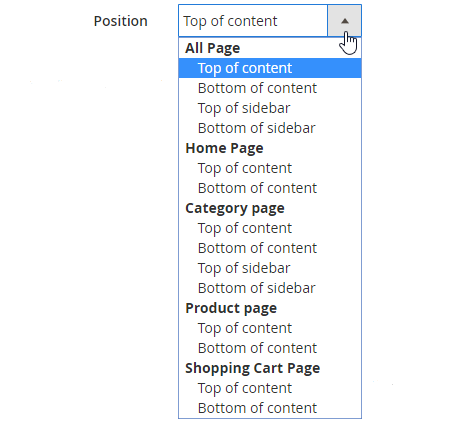 Title: The content filled in this field will be the name of the slider displaying on the frontend. Description: Describe about the slider. The description is also displayed on the frontend. 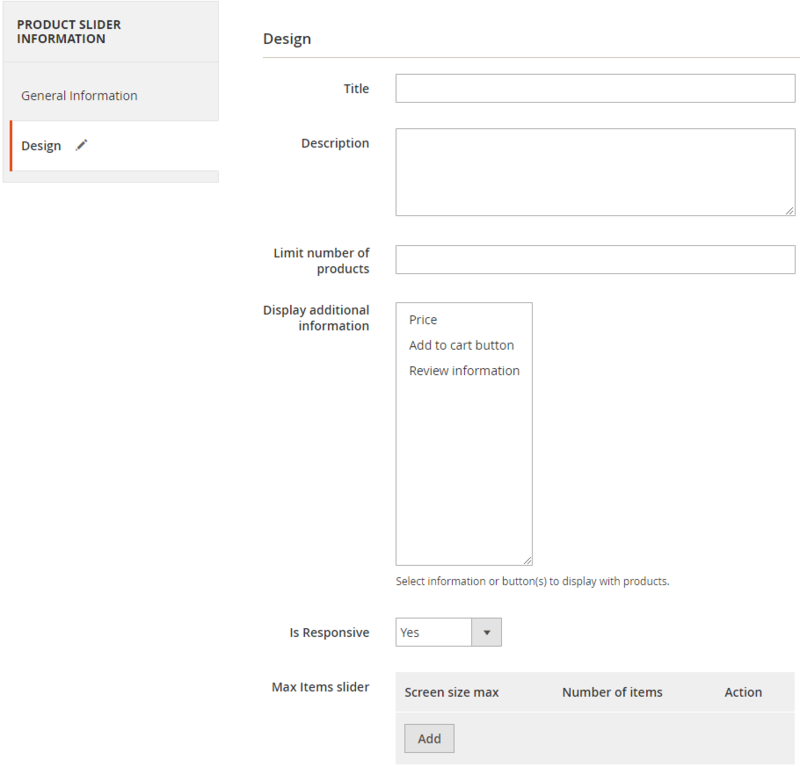 Limit number of products: Fill the maximum number of products on the slider. Choose Yes to allow changing the number of products displaying on the screen. 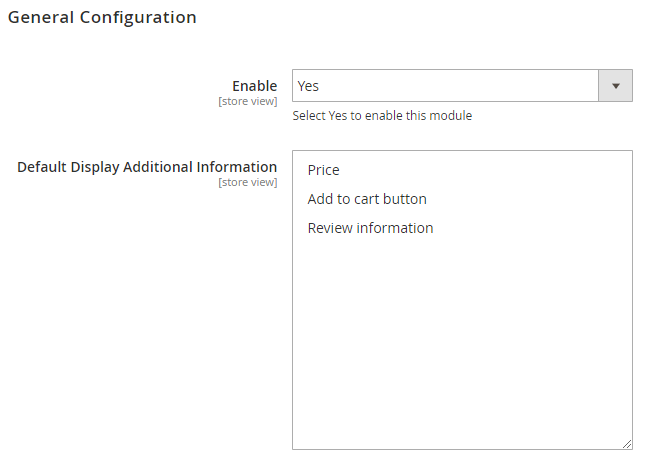 When you choosing Yes, the slider will ignore install the Responsive in the configuration. Choose Use Config to use Responsive in the Configuration. Max Items Slider: This field only displays when you choose Responsive = Yes. Installing the number of products show on the slider when the browser window changes the size. 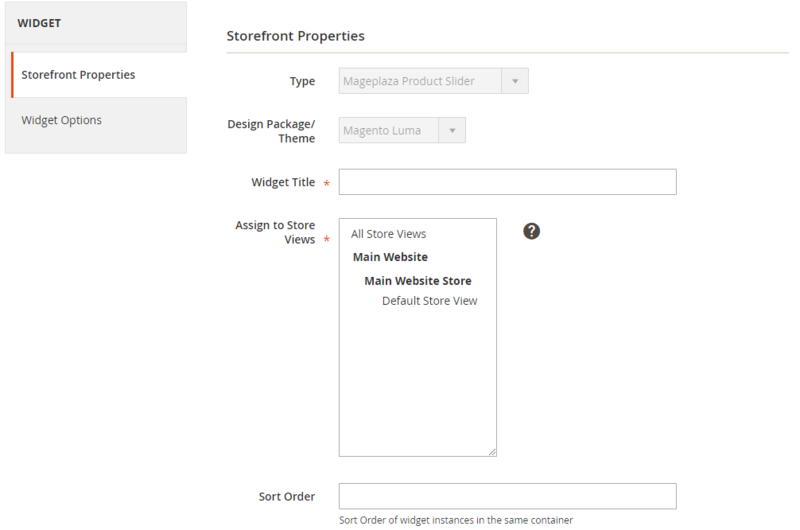 Step 2: Choose Type = Mageplaza Product Slider, Design Theme = Magento Luma. Afterward, click on Continue. Step 6: Save the widget and check on the frontend. We will show you how to use insert Product Slider in CMS page, Static Block, XML File, XML Data, .phtml file. You can paste the above block of snippet into CMS page such as Home page or specific CMS page or any CMS static block in Magento 2. Open layout file such as category_catalog_view.xml or XML Data and insert the above block of code, then all categories page will be added the product slider with 8 new products. Open a .phtml file and insert where you want to display the product slider. .. important:: In your theme, custom design, you should copy this file into your package and edit them instead of directly edit it. 4.3. Check this on the Frontend (You will see that it appears in the Product Slider if you have set). You can also check it in the Dashboard/Bestsellers field. 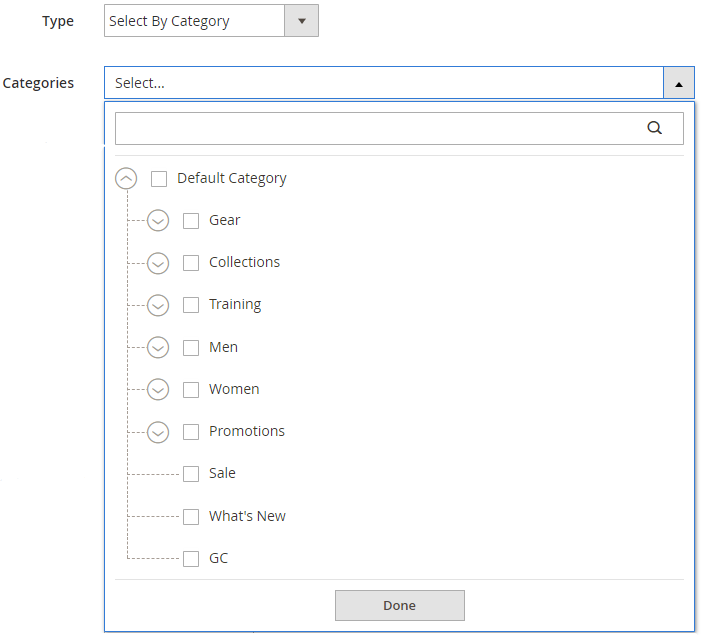 You can change the ID of the Category based on the ID of the Category in the Catalog/Categories field.